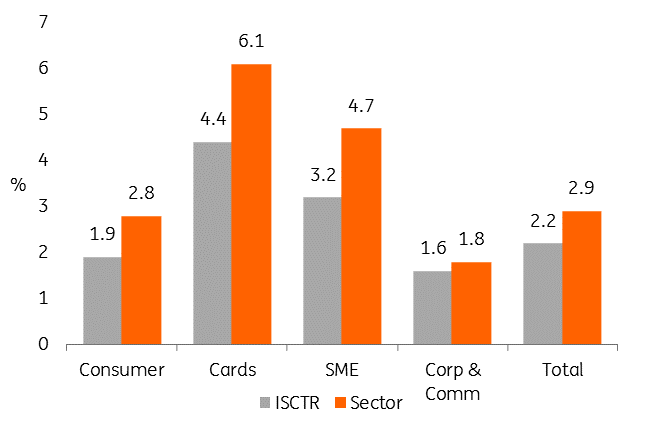 ISCTR reported strong growth in net income to TRY5.3bn (+12.9% YoY) in FY17, driven by loan growth and an annual rise in NIM (though NII weakened QoQ on weaker activity levels), while its loans/deposits ratio remained stable HoH at 117%. The P&L dynamics match what we have seen from the sector so far, but the loans/deposits stabilisation is impressive. Moreover, ISCTR’s asset-quality and capital positions are much stronger than average. The NPL ratio came in at 2.2%, benefiting by 13bp from NPL sales in 4Q and well below the sector average (3.0%), and the bank demonstrated outperformance across every major loan category. Capital was strong too. ISCTR ended FY17 with a Tier 1 ratio of 13.99% and CAR of 16.66%, up significantly YoY following successful Tier 2 issuance in June but down slightly QoQ due to growth in RWAs exacerbated by the weakening TRY. Regarding the outlook for this year, ISCTR expects loans to grow 13-14% (as we have seen elsewhere). However, importantly, it expects deposit growth to outpace loans at 17-18% (TRY). The NPL target of <3.0% lacks ambition and suggests we may see some modest weakening this year. Overall, this is a very strong set of results. The bank has grown its profits more slowly than peers but has avoided the asset-quality deterioration we have begun to see at some of its competitors. ISCTR reported a 12.9% YoY increase in net profits to TRY5.3 bn. 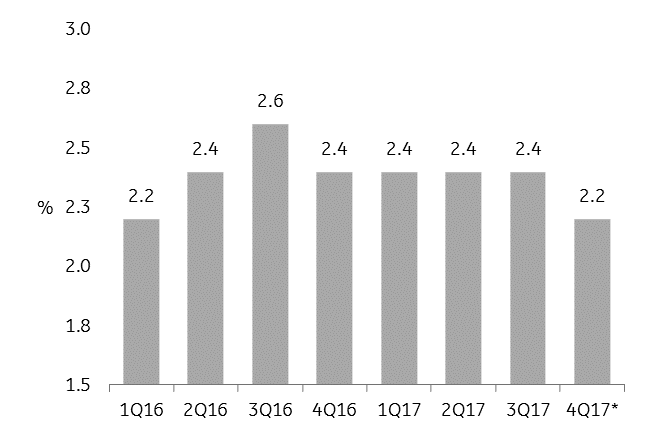 Net interest income rose 21.9% YoY to TRY13.2bn as loan volumes improved 17.9%, having stabilised in 2H17 after the early boost from the Credit Guarantee Fund (CGF), although NIM decreased 7bp (after swaps) to 3.86%. Despite a stronger 4Q performance driven by loan and deposit repricing and a favourable securities mix, the latter was hit by higher funding costs during 2017. We expect a stronger dynamic in 2018 as loan repricing gains traction. ISCTR’s TRY loan/deposit spread fell from 6.21% to 5.47% over the period, while in FX it was more stable, declining from 4.67% to 4.38. Moving on from NII, Fees & Commissions enjoyed another solid year, rising 18.8% to TRY3.4bn, while the adjusted cost/income ratio weakened modestly from 42.3% to 42.7%. A stronger-than-expected performance in asset quality further increased our confidence in the bank. The cost of risk came in within budget at 109bp, while the headline NPL ratio fell 20bp to 2.2%, including a 13bp impact from NPL sales in 4Q. This ratio is one of the strongest in the sector and compares favourably to the sector average of 3.1%. Looking across business lines, NPL ratios in each segment were significantly stronger than the sector average (see Figure 2). The specific coverage ratio was also ahead of the sector average at 86%. Turning to liquidity and capitalisation, the loans/deposits ratio was maintained at a decent level of 117% (sector average: 120%), while the bank unsurprisingly showed more stretched liquidity metrics in TRY (152%) than in FX (86%), which is a feature common to the sector. Meanwhile, the Tier 1 ratio improved 85bp YoY to 14.0%, one of the strongest numbers in the sector, although the number declined modestly QoQ due to RWA inflation following TRY depreciation. Total CAR was robust at 16.7%, boosted by the Tier 2 security issued by the bank in June 2017 and well more than the legal minimum requirement of 8%. As for the loan book, we find it interesting to look at the main growth areas, which help us to identify the segments in which the bank sees the greatest opportunities. The headline 17.9% overall growth of the book to TRY239bn masks the divergence between loan classes. While TRY-denominated loans grew by 20.5% YoY, their FX counterparts rose just 6.1% in USD terms due to lack of demand (though the TRY devaluation meant that, in TRY terms, the FX book increased by 13.8%). Within the TRY book, Corporate & Commercial loans increased 27.9%, while SME loans rose by 24.8% and Retail by 12.5%. This reflects the deployment of CGF funds, which were aimed mostly at SMEs and smaller commercial businesses. By contrast, within the FX bucket, Corporate loans rose by just 6.0%. All this suggests that our thesis that Turkey’s large corporates represent the healthiest part of the economy continues to hold good. Corporate & Commercial loans accounted for 53.2% of ISCTR’s total loan book, unchanged from the prior-year period. We note that ISCTR’s assets and liabilities remain reasonably well matched by currency, although the lack of TRY funding remains a concern. On the asset side, FX securities comprised 19.6% of the total, while FX loans accounted for 38.4% of total loans. Meanwhile, FX deposits made up 52.3% of total deposits, up from 49.9% at end-FY16, as de-dollarisation continued. Finally, ISCTR expects 2018 loan growth to be around 13-14% (split TRY 14-15% and FX 5-6%), with deposits rising faster in TRY at 17-18% (FX: 3-4%). The NPL ratio is expected to remain below 3%, while the cost of risk could rise slightly to 115-120bp. CAR should remain above 14%. Once again, this points towards our central scenario that loan growth should diminish slightly in 2018, but asset quality is likely to remain under control, and large banks’ TRY loan/deposit ratio should gradually rebalance.